The weather is starting to change… great time to pick up some new clothing at our Mission House BAG SALE this week, Thursday thru Saturday! 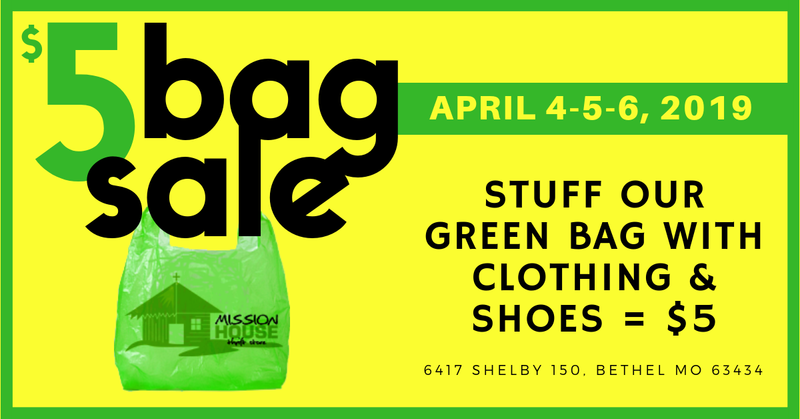 Stuff one of our green bags with clothing and shoes for just $5/bag. Normal hours are: Thursday from 10am-6pm, Friday 10am-4pm, Saturday 10am-2pm. Located across from Heartland Christian Academy. Donations are welcome, and may now be dropped off inside the building. Donations are accepted Monday through Wednesday from 10am to 3pm, and during our regular store hours. For more information, call 660-284-4175.